1. The format: In Thirteen Reasons Why, Jay Asher tells the story of a teenage girl's death in a way that is both original and effective. Taking its cue from the buttons on an old-fashioned Walkman, the story plays out as Clay Jensen roams around town stopping, pausing, and playing his way through Hannah Baker's verbal suicide note. This clever technique gives a new spin to the exploration of an issue that haunts us all. 2. The voice: Books narrated by dead people aren't all that unusual, but this one takes the concept in a new direction. Through the audio tapes Hannah recorded before she killed herself, we're able to "hear" her voice, helping us understand who she was and what she became. I kept wondering why Asher chose Clay to co-narrate, since he was such a bland character, but I think Clay's there as more of a canvas. Hannah comes alive enough that she could carry the novel alone. Still, Clay's thoughts round out the story, making it deeper, more complex and, ultimately, more interesting. 3. The suspense: Unlike other issue novels, Asher's reads almost like a mystery/thriller. The pacing moves things right along, keeping the reader on edge as he flies through the story. Even though the plot didn't surprise me much or really blow me away, it kept me as engrossed as any John Grisham or James Patterson pageturner. 4. The moral: While Thirteen Reasons Why never comes off as preachy, there are definitely lessons to be learned from it. As Hannah details all the ways in which people wronged her, it becomes clear how deeply words, even those meant in jest, can wound a person. Asher doesn't knock us over the head with platitudes, but his message gets through loud and clear: Be careful with other people's feelings. 5. The debate: Asher writes about suicide with sensitivity, while still allowing Clay to play devil's advocate. While I believe the responsibility for a person's suicide should be placed solely on the shoulders of that person, others might disagree. The issue would make for interesting discussions in schools, book clubs, or on blogs/message boards. 6. The acknowledgment: In an interview included in my copy of the book, Asher said, "Some people, primarily adults, would rather there be no books dealing with controversial subjects, even if those books help start a dialogue between teens and adults." I'm not one of those adults. I think readers of all ages will recognize themselves in Hannah, which will hopefully make them feel less alone. I'm all for helping people get the understanding and support they need, especially if it prevents them from thinking suicide is the only answer to their problems. 7. The overabundance of paranormal teen lit: Maybe this type of book is what made you turn to paranormal stories in the first place. Reality can be harsh, that's a fact. However, I think well-written issue novels like Thirteen Reasons Why prove why contemporary novels are still so relevant. Who cares about broody teenage vampires when realistic books give you meaty, true-to-life issues on which to chew? 8. The acclaim: If I haven't convinced you yet, consider the many awards this book has received. Click here for a full list. 9. The blurbs: Don't believe me? Ask the experts. 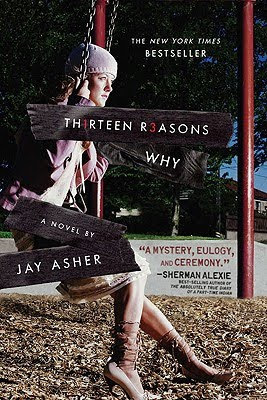 Chris Crutcher, Sherman Alexie, Ellen Hopkins and Gordon Korman all wrote excellent blurbs about Thirteen Reasons Why. Check them out here. 10. The reviews: Thirteen Reasons Why gets 4 1/2 out of 5 stars from Amazon reviewers, the same from Barnes & Noble readers, 4 out of 5 stars at Goodreads, and rave reviews from all kinds of book bloggers. 11. The blog: Jay Asher's funny. Just check out his posts. 12. The website: If you don't read the book, you may not understand the book's excellent website, which offers lots of extras, like videos of all the different tapes, wallpaper, an interactive version of Hannah's map, and more. 13. The giveaway: Okay, if I haven't managed to convince you yet, then read the book for a chance to earn free stuff. Everyone likes prizes, right? Well, when Jay Asher gets 13,000 reader reviews of Thirteen Reasons Why posted to his website, he'll give away copies of his books to four lucky winners. Check out the contest here. i really enjoyed this too, and I totally agree about your comment re: paranormal vs contemp, as I am not a big paranormal fan... at all. readalikes I would suggest to people who enjoy this book is: Wintergirls by Laurie Halse Anderson and Looking for Alaska by John Green. I hope you enjoy those if you haven't read them yet! I read this last year. It was definitely one of the best books I read in 2010!! I rated it 5 stars on goodreads! After reading it, I borrowed the audiobook from the library, and enjoyed it just as much. I would highly recommend the book! I will have to definitely try this one.Sounds good. What would be an appropriate age to let someone read this book. Is 14 a good an appropriate age? I read the book when I was fifteen, it was absolutely inspiring ! I have recommended it to many people since it is so realistic to the problems that teens have on a day to day basis, whether or not adults want to admit it. I think it depends on the maturity of the reader as to what age they should read it since it is about a very touchy subject but in the end whoever reads it will get an incredible lesson out of it! Read this book! Its well-written, emotionally cathartic, & just compelling. Just make sure you have some tissues on hand for the inevitable tears.